HITTING THE BOOKS: Tamika Frances is off to a great start at USC after receiving a $20,000 Renouf Family Scholarship. KEEN Kenilworth writer Tamika Francis was on the right track for university in Year 11 when she completed two Headstart courses at USC. 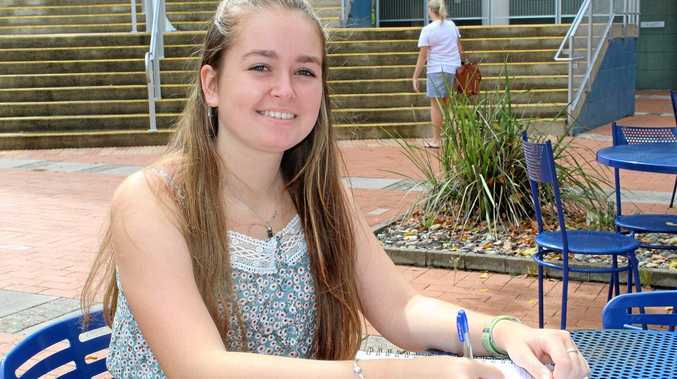 And the 17-year-old certainly hit her stride this week when she started a journalism degree on campus at Sippy Downs - with the assistance of a $20,000 Renouf Family Scholarship. Tamika, who earned an OP2 last year while she was a Burnside State High School captain, said she and her family were excited about the recognition of her dedication and hard work. "I made a good choice to study two uni courses in Year 11 - introductions to journalism and creative writing - because they steered me towards the right degree,” said the Kenilworth resident who works part time at a local cafe. "I've always loved writing and I wanted to study at USC because it's close and I didn't want to live in the city. Renouf Family Scholarships, for high-achieving undergraduate students, were established in 2008 by Sir Clem Renouf in memory of his parents for their sacrifice in giving him the best educational opportunity possible, under challenging circumstances. Tamika, who received multiple academic awards at school and was volleyball team captain in Year 11, said she was looking forward to majoring in marketing in her Bachelor of Communication (Journalism) and intended to investigate all career options. She enjoyed participating in charity fundraisers at school and has continued her involvement with YLead, a not-for-profit organisation promoting youth leadership. "I went on a three-day camp as a student last year and it developed my self-confidence surrounded by similar-minded people. "This year I've joined as a mentor because I want to give that experience to others,” Tamika said.